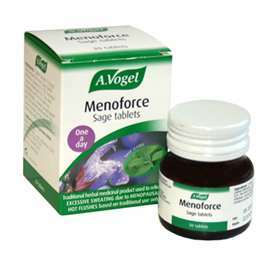 A. Vogel Menoforce Sage Tablets 30. Made with freshly harvested Sage (Salvia officinalis). Menoforce is for the relief of hot flushes and night sweats often experienced during the menopause. Sage has a balancing effect on hormones, is hypothalamic, antibacterial and an astringent. Pack of 30 one-a-day tablets. Freshly harvested Sage (Salvia officinalis), a very popular herb with women, is used in this preparation. Sage has a balancing effect on the hypothalamus and temperature control. When drunk, it can also reduce the secretion of saliva. Important! Seek advice from a health care professional before taking this product if you are diabetic, epileptic, taking Tamoxifen or Oral Contraceptives. 1 tablet contains 51mg of dried tincture from fresh sage (Salvia Officinalis L.) leaves(1:17-18). Extraction solvent: ethanol 68% V/V. The other ingredients used for the tablet are microcrystalline cellulose, sucrose laurate and hydrogenated cottonseed oil. This product contains sucrose.